The Philadelphia Phillies slide and offensive meltdown continues as the team heads into the final game of a nine game NL East road trip. With easy victories the past two games, the Atlanta Braves have ensured that they will be in first place when the Phillies leave town this evening. The current hitting woes have extended beyond the label "slump" to outright "embarassment" for a team that fancies itself as an offensive powerhouse. To review, the Phillies have scored a paltry 13 runs in the last 10 games. They posted a bagel against the New York Mets on the Citi Field scoreboard— for a three game series! This feat seems particularly incomprehensible since no one named Seaver, Gooden, Cone, or Santana was involved. Taking into account their body of work before and after their trip to the Big Apple, the Phils were shut out an incredible five times in eight contests. And, in one of those goose egg games, they came within an eighth inning bloop single of being no-hit by a pitcher sporting a 7.52 ERA against the rest of baseball. Perhaps the most telling testimony is that pitcher Roy Halladay was actually lucky to win a perfect game on Saturday night. The masterpiece would have fallen into baseball infamy had it not been for an unearned run donated by the Florida Marlins. 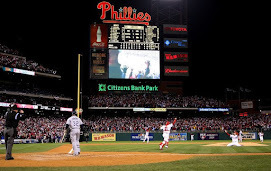 With the aid of Halladay's perfect game, the Phillies are 2-8 over their past 10 games. This is particularly troublesome since the Braves have won seven straight and 17 of the past 21 games. It has gotten so bad that the three spots posted by the Braves in the first inning the past two days has created the sinking sense of "game over." That feeling proved to be untrue in that the Phillies "exploded" for three runs in each of those games. Of course, the Braves did not stop there, scoring nine and seven respectively to record easy "bring in the rookie hurler to get some work" type victories. To be fair, the Fightin's are missing the left-side of their infield— Jimmy Rollins and Placido Polanco. Both players were instrumental in the team's fast offensive start. Although there have been many factors, perhaps the current situation highlights Rollins' overall importance to the team as an offensive catalyst, defensive anchor, and leader? The Phillies are a robust 9-3 with him— and 19-20 without him. As far as the players who are in uniform and on the field, it appears to be a case of Murphy's Law meeting high anxiety. Hitters are pressing so much that CSI forensic scientists would likely find hints of saw dust on every player's batting gloves. Needless to say, it is a very difficult way to make a living as a major league hitter— at least if you want to exceed the Mendoza line. And, when the Phillies do show promise of some much needed prosperity, Murphy's Law seems to always kick in. Long drives find a way of crashing against the top of the outfield fence— and always seemingly with two outs. Runners in scoring position always seem to have to hold at third on base hits. And, batters inevitably seem to whiff or popout with runners at third and less than two outs. If not, they smack a hard one hopper that turns into an inning ending twin killing. Some of this is obviously operator error, but some of it is just the "bad luck" that follows athletes around that are simply pressing to make each at bat the offensive renaissance. It's a bit of a "Catch-22", but rest assured that Murphy will keep stalking the Phils until the players shed the weights they are carrying on their shoulders. 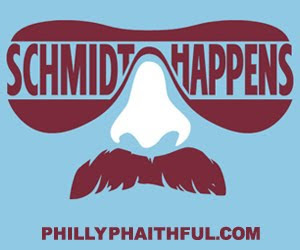 Let's hope they do it soon because they are dragging an entire Philly fanbase down with them.